Disclaimer: This material is not intended to be used in English. The translation in English is provided for informational purposes only. The opinions and information presented in the Teaching material do not necessarily reflect the policy and position of ODIHR. The material was produces in the frames of the OSCE/ODIHR and the Anne Frank House project, in cooperation with the Ministry of Foreign Affairs, Ministry of Youth and Sports, and Ministry of Education of the Republic of Serbia. The project was realised during 2016-2018. 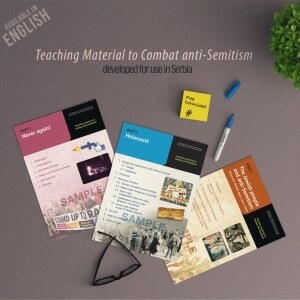 Teaching Material to Combat anti-Semitism was produced by a team of Serbian experts, in cooperation with the Anne Frank House experts, and the Project Implementation National Task Force team. 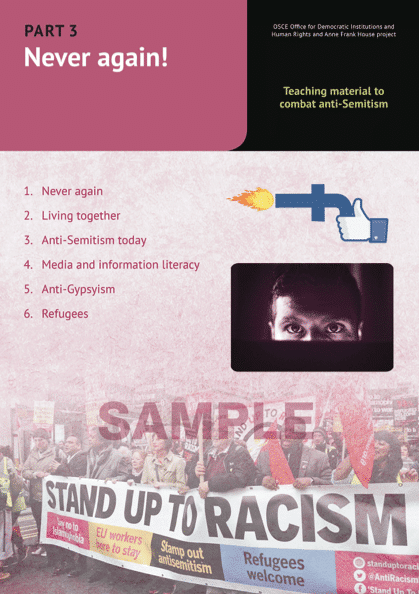 It was published and presented in December 2018 with the support of the OSCE Office for Democratic Institutions and Human Rights (ODIHR) Words into Action to Address Anti-Semitism project. The Director of the Institute for Improvement of Education of the Republic of Serbia has approved the publishing and use of this additional teaching material in Serbian schools by Decision No. 1639-3/2018, from 15 October 2018. 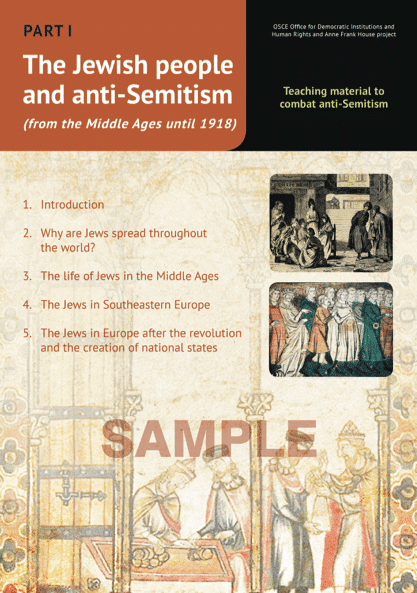 The Teaching Material to Combat anti-Semitism is developed with the aim to enable the students to recognize anti-Semitism, as well as other forms of intolerance and discrimination, and learn how to confront them. We would like to express our appreciation to all members of the Project Implementation National Task Force. We would especially like to express our gratitude to all who offered their considerable assistance and contributed their important expertise in preparation of this material (in alphabetic order): Ilan Cohn, Јаn-Еrik Dubbеlmаn, Jan Fahlbusch, Rubеn Fuks, Аnne Giebеl, Jelena Jokanović, Irena Mirković, Dragana Mladenović-Nestorović, Rоksаnda Ninčić, Аlеksаndаr Nеćаk, Bојаna Pеrоvić, Karen Polak, Аlеksаndra Pоpоvić, Dаnica Stеfаnоvić, Bilјаna Stојаnоvić, Rоbеrt Sаbаdоš, Sоnja Viličić, Anna Zielinska, as well as the Historical Archives of Belgrade, Jewish Historical Museum in Belgrade, National Youth Council of Serbia, Jewish Community of Novi Sad’s Teenage Club, and the young people Zlatica, Zlatija, Ilija, Matija, Milan, Mihajlo and Sara, we have learnt so much from during the workshop at Andrevlje. Since 2006 ODIHR and the Anne Frank House in Amsterdam have worked on developing, in co-operation with national experts from 14 OSCE participating States, teaching materials to combat anti-Semitism that deal with a variety of aspects of this phenomenon. Serbia is 15th country to incorporate the project. Explore and view other teaching materials available in English developed by Terraforming: Ready2Print exhibition “Some Words About the Holocaust in Serbia”, or Ester – a collection of graphic novels and a teaching material, its most important part being a series of dramatised stories about the Jewish victims killed in the Jewish Camp at Sajmište (Judenlager Semlin) near Belgrade.